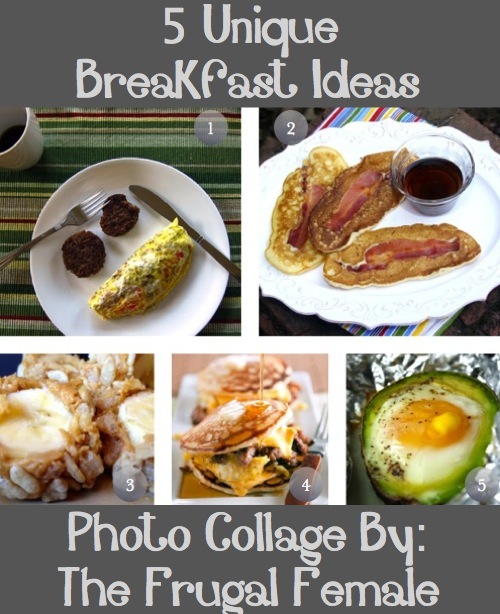 If you are tired of serving up a boring bowl of cereal or oatmeal for breakfast, check out these 5 unique breakfast ideas! My favorite is the Ziploc omelet. An omelet is not unique, but they way they prepare it is genius! The bacon pancakes look simple enough to make, so we might be having those on my household menu soon! I am definitely interested in making the banana sushi bites. I love the combination of bananas and peanut butter! Paula Deen’s pancake egg sandwich is unbelievable! I cannot imagine how many calories are in one of those things!!!! My husband would absolutely love the eggvocado. He eats avocado with everything! I can see those added to my breakfast menu as well.